The Guest Lecturer, Rt. Hon. Dimeji Sabur Bankole delivering his Lecture during the 2012/2013 Commencement lecture. The immediate past Speaker of the House of Representatives, Rt. Hon. Dimeji Sabur Bankole (CFR) has described the Federal University of Agriculture, Abeokuta (FUNAAB) as a worthy example of good leadership and mentorship. Hon. 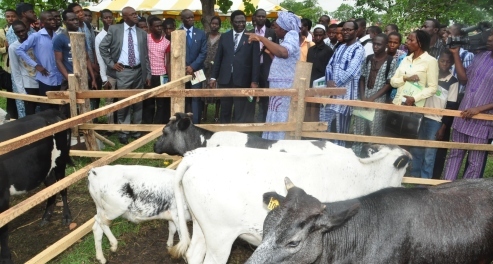 Bankole stated this, even as he called on the Federal, State, Local Government and other stakeholders to ensure that only experts, who have passed through the Universities of Agriculture are entrusted with the leadership of Ministries of Agriculture and other related agencies, in order to ensure that round peg are put in round hole, to enhance service delivery. Besides, the former Federal Lawmaker, also charged students of the University, not only to adopt their Lecturers as mentors, but to respect them and remember them for good when they become great leaders in life. Hon. Bankole dropped the hints aforementioned, while “speaking from the heart as a concerned Nigerian and delivering his Address titled, “Mentoring And The Challenge of Leadership in Africa”. He was the Guest Speaker at the University’s maiden edition of “Commencement Lecture”, heralding and marking the beginning of the 2012/2013 Academic Session, while successive sessions will follow suit subsequently. Commencement Lecture is one of the lofty and proactive initiatives of Professor Olusola Bandele Oyewole’s administration, targeted at sustaining the University Community and its external stakeholders, within the ambit of the framework, envisaged for new Academic Session, with a view to also foster a robust town and gown relationship. The Lecture, as a matter of fact, lived up to billing and the ambience evinced no less on Wednesday, as the sprawling Professor Mahmood Yakubu Lecture Theatre was fully occupied by staff, students, journalists, special guests and well wishers, who witnessed the intellectual discourse. The noticeable presence of the Chairman of the occasion, the immediate past Head of Service, Prof. Oladapo Afolabi, Guest Speaker, Hon. Bankole, the Pro-Chancellor and Chairman, Governing Council, Chief Lawrence Ayinde Olakunle Osayemi (MON), Council members, Professor Oyewole led Principal Officers and students Executive added value and glamour to the Lecture. However, the occasion peaked when Hon. Bankole mounted the podium to deliver his Lecture. FUNAAB was the highpoint of his delivery and it was commendation galore while his candid assessment of leadership and mentorship took the centre stage. X-raying the University in the context of the theme of his Lecture, Hon. Bankole said FUNAAB is worthy of emulation in the area of good leadership and mentoring, having harnessed its tripodal mandate of teaching, research and extension services to develop the nation. He also commended the University saying the cordial relationship between the management, staff and students is exemplary. According to him, “The Federal University of Agriculture has in the past two decades emerged as a leading institution in a very sensitive sector of our national life. Through its teaching, research and community outreach activities, the University has contributed in no small measure to our country’s quest for food security and national development”. “The relationship between the Management, staff and students of this great institution remains a worthy exemple on the usefulness of mentoring, which recommends itself to other entities,” he added. Speaking further, the nation’s former number four man lamented that Universities of Agriculture are being denied the privilege of mentoring the nation’s agricultural sector because government often looked elsewhere, while appointing top functionaries to handle the sector at all tiers of governance. Describing the trend as abnormal, Hon. Bankole called on relevant authorities, to ensure that only experts from Universities of Agriculture in the country are offered top ranking jobs like Minister in the agricultural sector, in order to achieve maximum efficiency.